Ottoman and small seat replacement cushions section. Faded and worn out foot stool cushions are easy to replace. Find the size that works with your ottoman, select your fabric and within a matter of weeks you have a fresh one. Ottoman and footrest cushions have the power to tie your entire room together. These are made to order with many designer fabric choices and Sunbrella material available. Ottoman pieces are uniquely stylish in their own right. However, if you have recently bought an antique or outdated ottoman and want to transform the way it looks there is a simply solution. 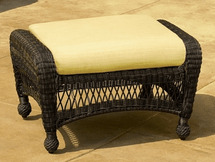 Consider our ottoman and footrest replacement cushions. Customize Your Ottoman As is the standard for all of our cushions, we have a wide selection of fabrics and materials to choose from. Whether you like the standard geometric style of modern cushions or if you prefer a solid colored fabric, we have nearly every style option you crave. Choose Your Cushion We have plenty of cushions available for you to choose from giving you the power to decide on the thickness and comfort level of your ottoman�s cushion. If performance and style is what you are looking for than look no further than our collection of customizable and standard ottoman cushions. Transform your furniture pieces by replacing the old cushions with stylish, clean, and comfortable options from the finest brands in the fabric business. Don�t settle for an ottoman or footrest that doesn�t suit your tastes. Instead, browse through our array of options and decide on the style you like for the price you want!